A large class of locos built between 1869 and 1899 with numerous variations in boiler, tanks, cab and bunker. Thirty one were rebuilt with much larger tanks in 1898/9. The kit depicts a loco with medium tanks, half-cab and either belpaire or round top boiler. 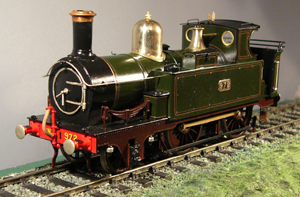 Our kit is in etched brass with cast brass fittings, sprung buffers and pre-rolled boiler. Motor, Wheels and Gears needed to complete (See Options). July 2014. Back in stock.